happy halloween! 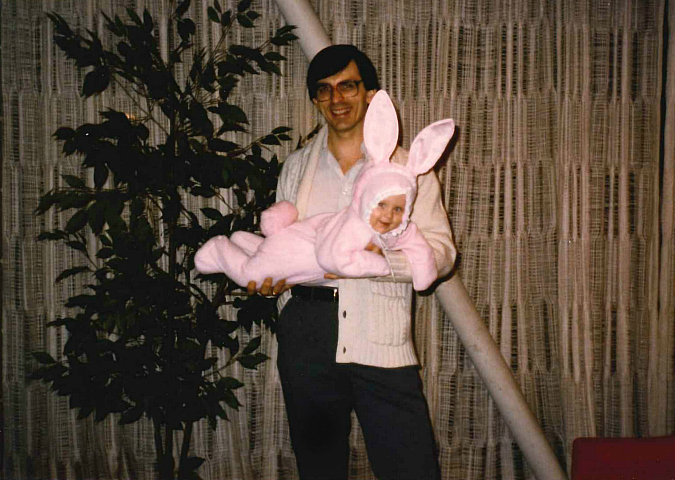 behold this ancient photo of me dressed as a bunny for one of my first halloweens. that's right, leave it to my parents to confuse a kid as to whether or not it was easter or halloween and whether or not the easter bunny or the great pumpkin was coming that night! every time we see this picture we all get a good laugh. fast forward 30-some years later and i'm looking forward to spending quality father-daughter halloween time with my dad again who is coming up to do trick-or-treat at my house tonight because ryan has to work. every year we get a ton of trick-or-treaters at our house. we bought a bunch of candy, so let the fun commence! i always love seeing what everyone dresses up as for halloween! I got a good laugh reading your blog, and you are probably still confused. Never looked at it that way. Funny we found the ears and tail a couple of weeks ago cleaning the attic. You and Dad have a good time trick or treating and do not scare the little kids. Can't wait to see your costume. Have fun with the trick-or-treaters! It's too bad that Ryan has to work.